A fleeting moment of pride on the bathroom scale before realizing this is less of a dietary wonder and more of a hydration blunder. 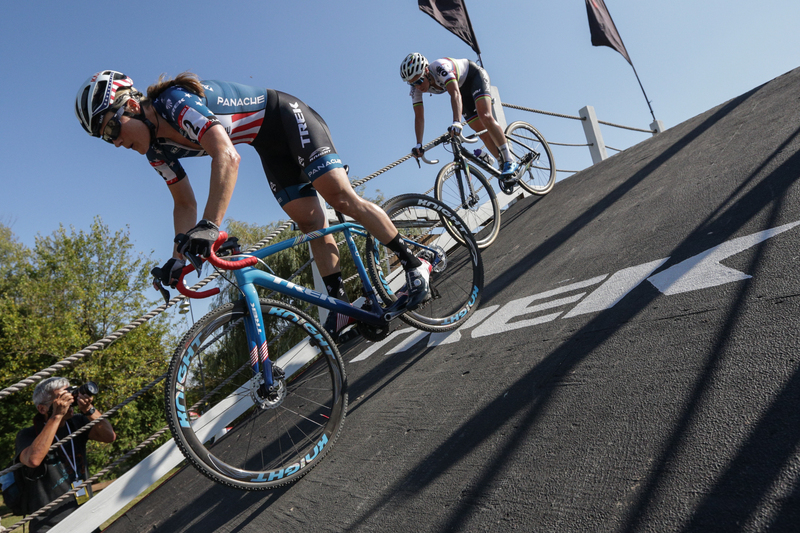 The previous day, Bill and I previewed the new Trek CX Cup course and turned a few laps on borrowed Trek Crocketts. 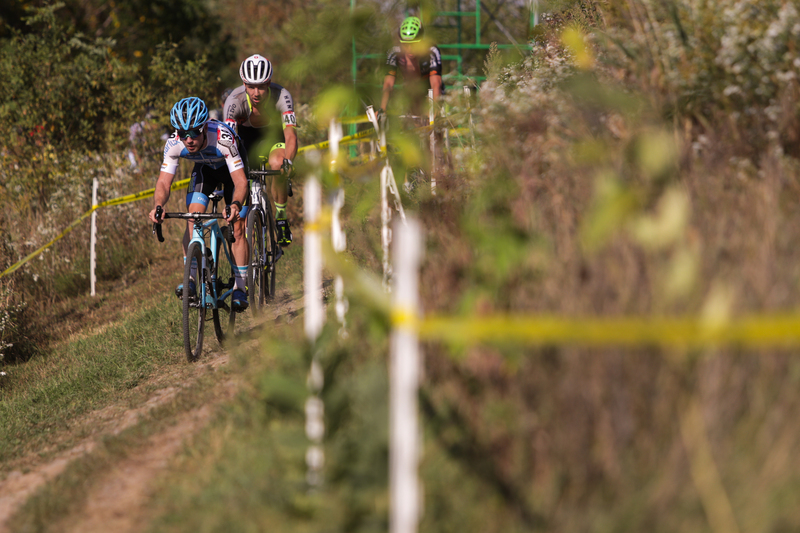 Built mostly on old cornfields and a hilly wooded section that was once a town dump, course designer Scott Daubert crafted a well-balanced circuit with equal parts power sections and punchy technical spots. 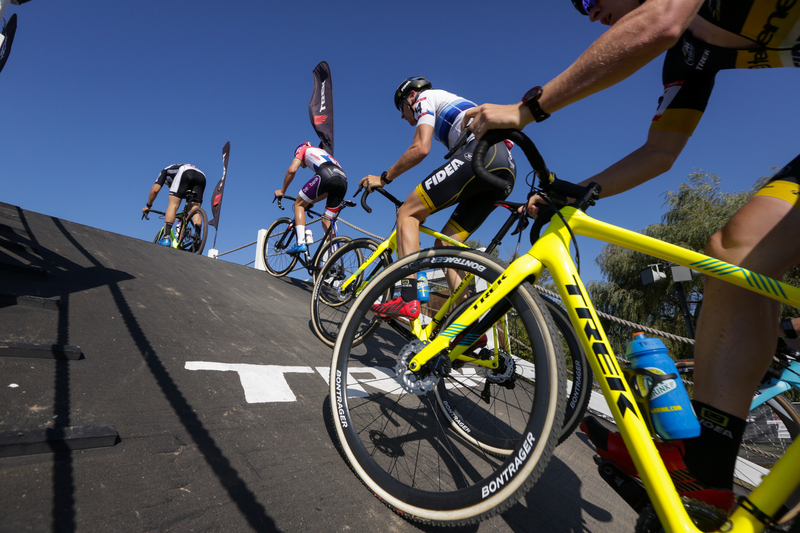 Open fields provide long dragstrips of flat yet bumpy terrain where racers will go full gas. The woods shelter a steep grade that hugs the edge of Trek headquarters, earning it the name “Factory Hill.” Rather than routing straight up and down the grade, the course incorporates World-Cup-caliber off-camber sections that can wash out wheels in wet or dry conditions. After a couple of laps, I’m already soaked in sweat. Credit some of that to the difficulty of the course, but mainly it’s the heat. Mid-summer weather is back. Temperatures are in the 90s. Add in a good dose of humidity with full sun and it’s sweltering here. Efforts to rehydrate throughout the evening fell short. It’s the morning of the UCI C2 race and I’m in deficit. Not much I can do at this point to gain it back. Coffee has water in it, right? More coffee. At the venue, I try to keep sipping water throughout the day. Also coffee. In the media center, no one wants to go outside of our air-conditioned oasis until it’s absolutely necessary. Ten minutes until call-ups for the elite women and I head out under the broiler. 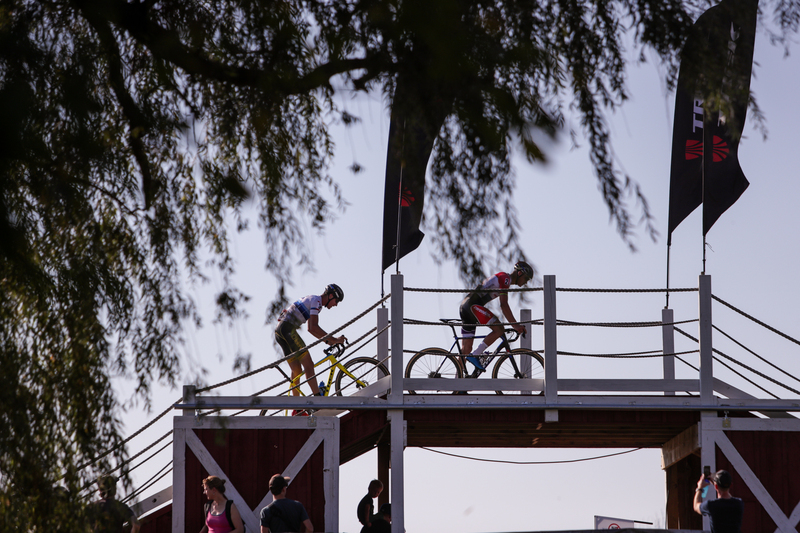 UCI officials try to keep things moving quickly so that riders won’t have to stay in the sun-soaked pen for long. Call-ups are quick. The countdown is moving. 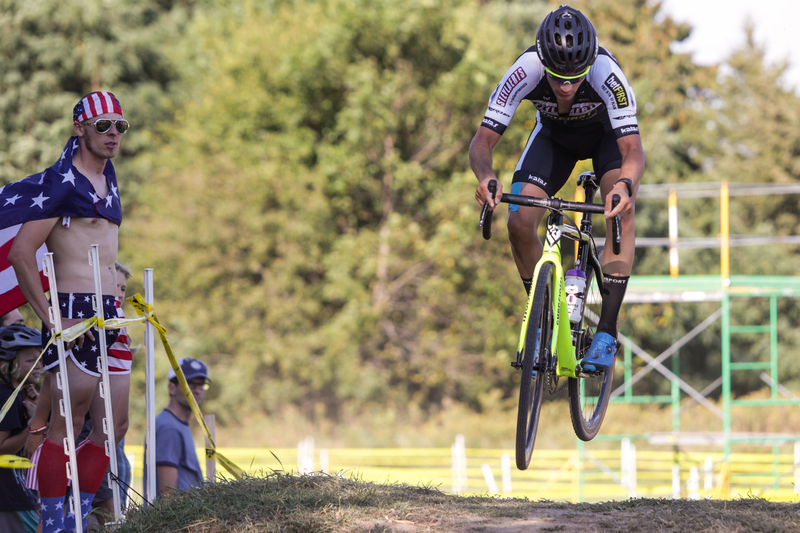 The start sounds and racers jet down a short straightaway that tests the minimums of UCI course regulations. A quick tour through the fields then up and over the barn-themed flyover. 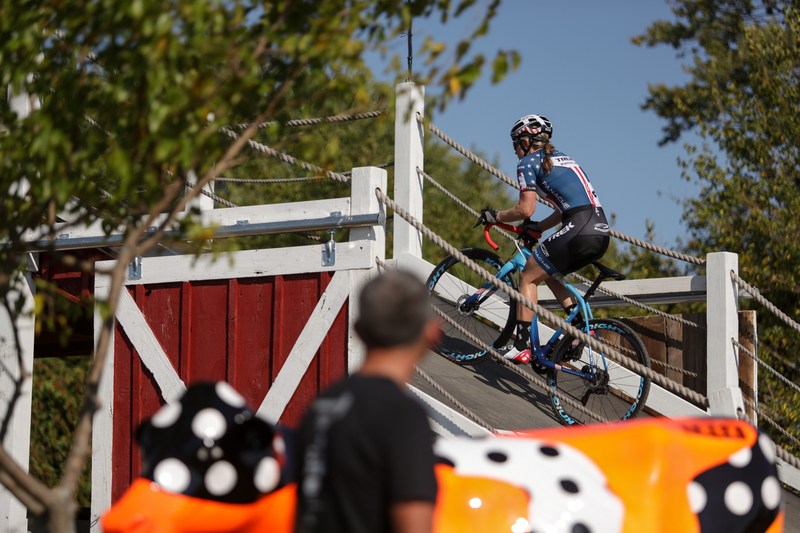 Throughout the day, racers and spectators pass by numerous plastic Project One cows, decorated by Trek’s custom paint shop. They are a bit of a wayfinding tool, marking some key spots on course. Riders hit a sweet tabletop that was presumably built by Trek’s mountain bike tribe. No one is getting rad, though. Too hot to send it. Keep efforts to a minimum. Don’t spike your body temperature. Think snowy thoughts. 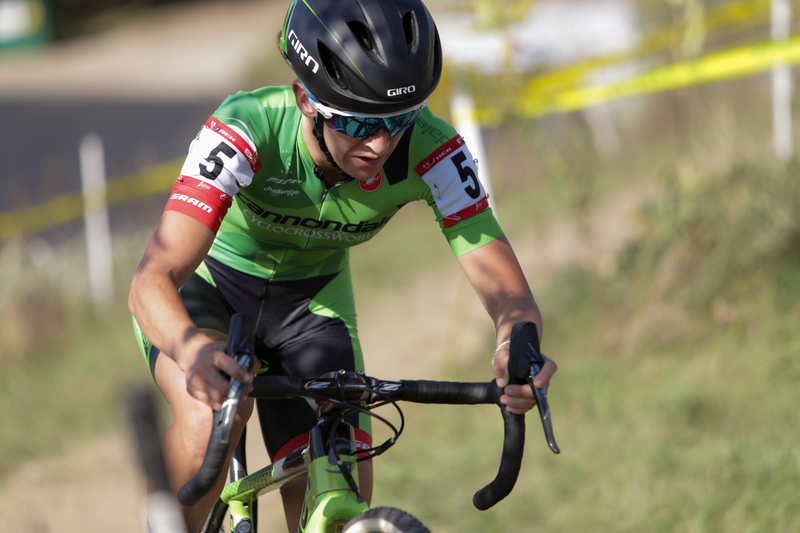 Remember CX Nats in Hartford last January? Good times. The field stays mostly together in the early laps. But it’s not long before the combination of excessive heat and the hard pace take their toll. Gaps are forming and leaders are emerging. 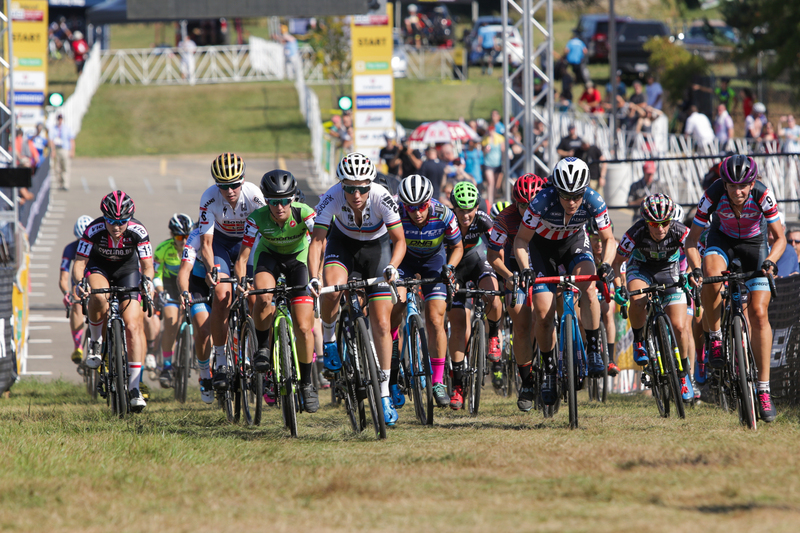 U.S. Champion Katie Compton and World Champion Sanne Cant work the front with Helen Wyman, Kaitie Keough and Christel Ferrier-Bruneau in the mix. Keough drops her chain after the flyover. She chases, but the race is gone. She’ll finish 7th on the day. Helen Wyman decides to take a dig, but pays dearly for it. She falls off the pace, succumbs to the heat and drops out of the race. Ferrier-Bruneau stays strong, but not enough to match Compton and Cant. The champs are gone. The winner will come from this duo. They trade the lead back and forth until Compton leads through a tricky set of wooden stairs. It’s a tight gap between the logs and—for those who plan to ride them—tough to get the timing right. Compton cleans it. Cant plants her front wheel hard into the top step and goes over her bars. She stays calm, gathers herself. Inside, she’s undoubtedly debating if it’s worth it to risk dooming her chances at Sunday’s World Cup race by making mistakes today. She remounts and settles back into her pace. After two more crashes, there’s no need for further debate. She drops out. Save it for Sunday. Compton has a clear path to the finish. 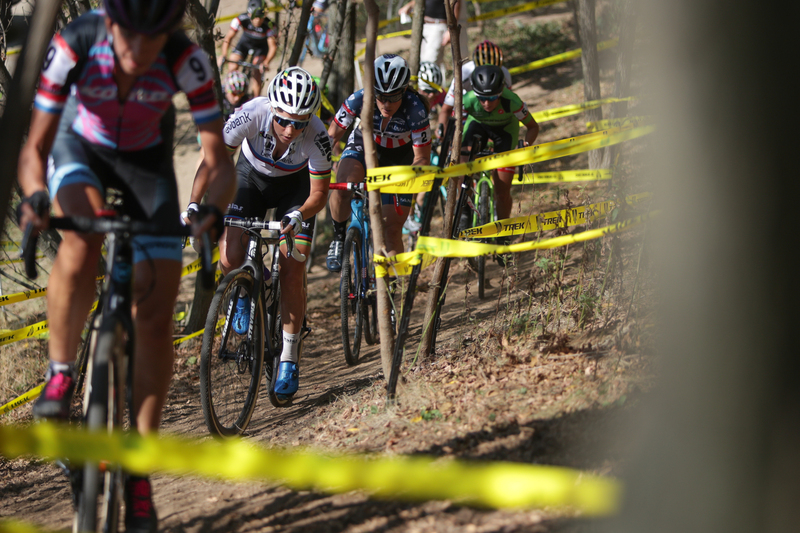 She flats with 1.5 laps to go, but has plenty of gap to keep her lead. The race is winding down and riders are quickly running out of gas. Rider lap times are increasing, except from Loes Sels, who continues to push a hard pace and overtakes Ferrier-Bruneau. The podium is settled. 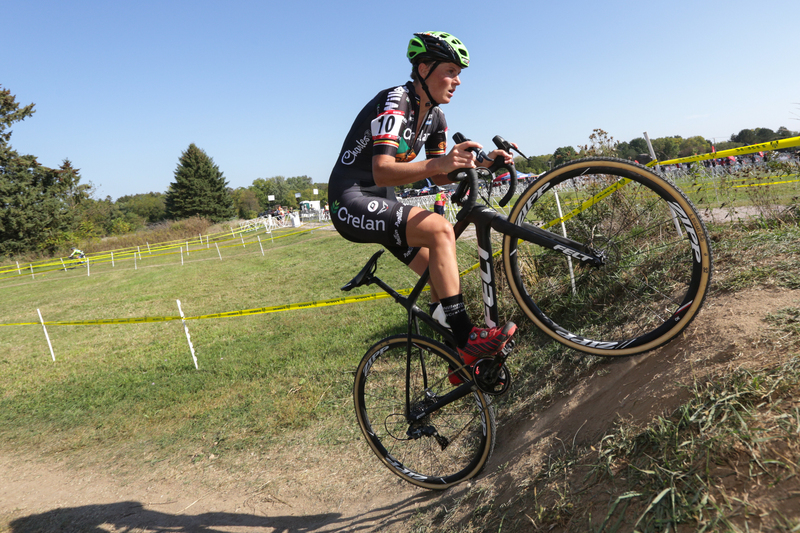 Today was a good test for Compton, after crashing hard last weekend at Jingle Cross and injuring her right shoulder. She rested up all week. Today’s race was supposed to be an “opener” effort in preparation for Sunday’s World Cup. She looks strong. Maybe the injury isn’t an issue. 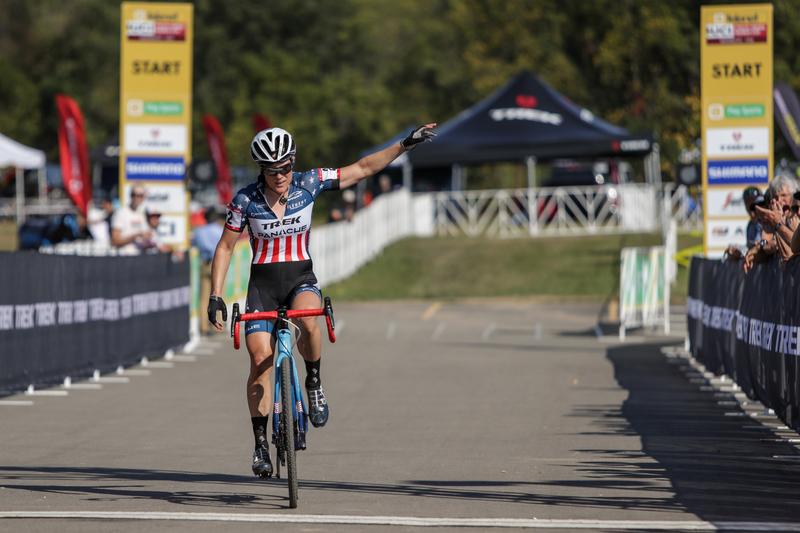 Compton rolls to the line and offers a one-armed victory salute, keeping her right arm down. Maybe the injury is an issue. Trekland is only getting hotter under the late-afternoon sun. Despite my best efforts, there’s no way to take in enough fluids. Company employees are out on course with a four-wheeler full of cold water and sports drinks. I grab a couple of bottles and down them in quick succession. Elite men are headed to staging. Gotta keep this thing moving. 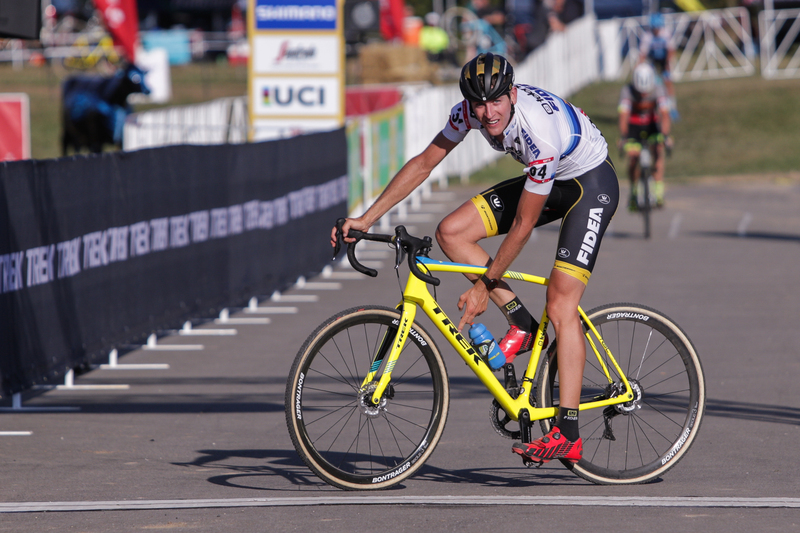 Just like at Jingle Cross, Mathieu van der Poel rolls to the start, sporting an ice vest. 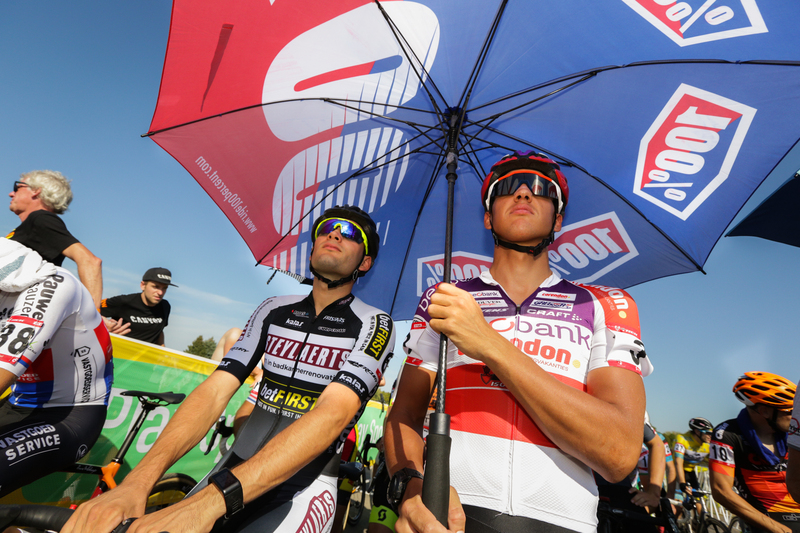 He, like teammate Tom Meeusen and Gianni Vermeersch, are taking shade under giant umbrellas. Everyone else is baking out here. There are lots of bottles on bikes today. UCI isn’t allowing feeds, so on-board hydration is the only option. The men’s race gets underway soon after call-ups. 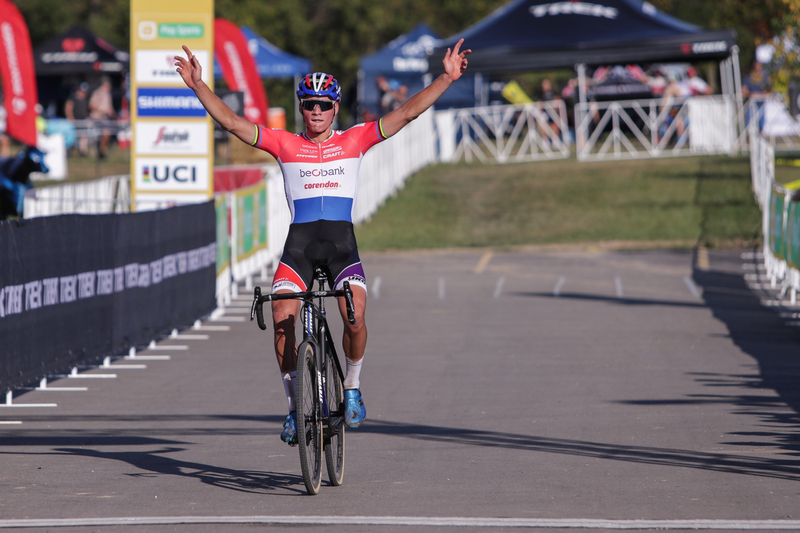 Van der Poel put on an impressive display of strength and skill at Jingle Cross, where he led from the gun. But he’s not interested in expending that level of effort today. It’s a C2. He’s here to test the course and to wake his legs up for Sunday. Wout van Aert is sitting this one out. So is Quinten Hermans. The Sweeck brothers, too. 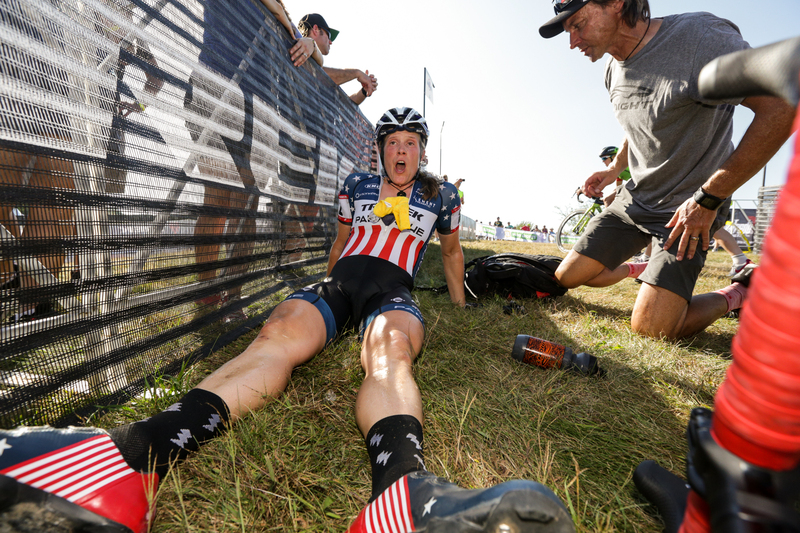 Kevin Pauwels, Stephen Hyde, Jeremy Powers are also absent … the Dutchman has nothing to prove here. As with the women’s race, the field stays mostly together early on. Just about everyone here is racing on Sunday. It’s all about putting in an honest effort. Three laps gone and van der Poel decides he needs breathing room. 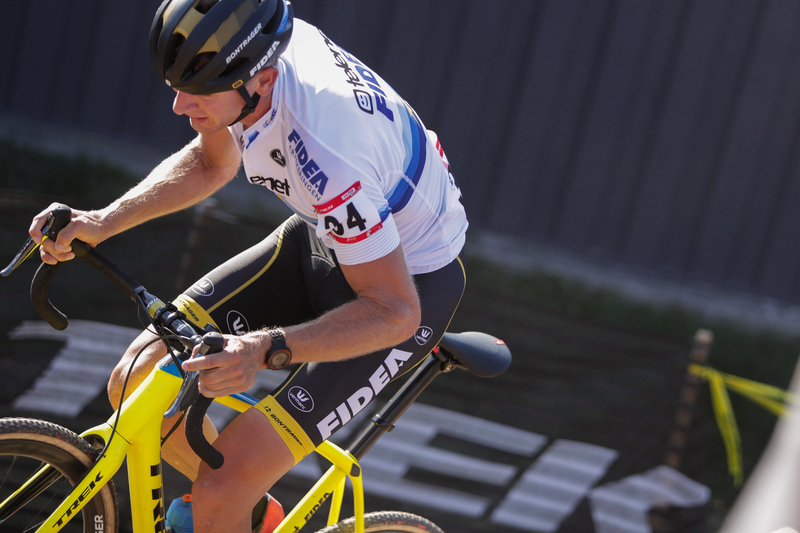 He ramps up his pace and only European Champion Toon Aerts can match him. Again, like the women’s race, two champions are at the head of the field. Just behind are chasers Vincent Baestaens, Eli Iserbyt, Tim Merlier, Corné van Kessel, Gianni Vermeersch and Tobin Ortenblad. Ortenblad fought hard to make this selection. This may be more than just a training race for him — he is holding his own with the European elite. Aerts also has more than training in mind. The race is in the shadow of his team’s bike sponsor. Time to repay that commitment with a result. 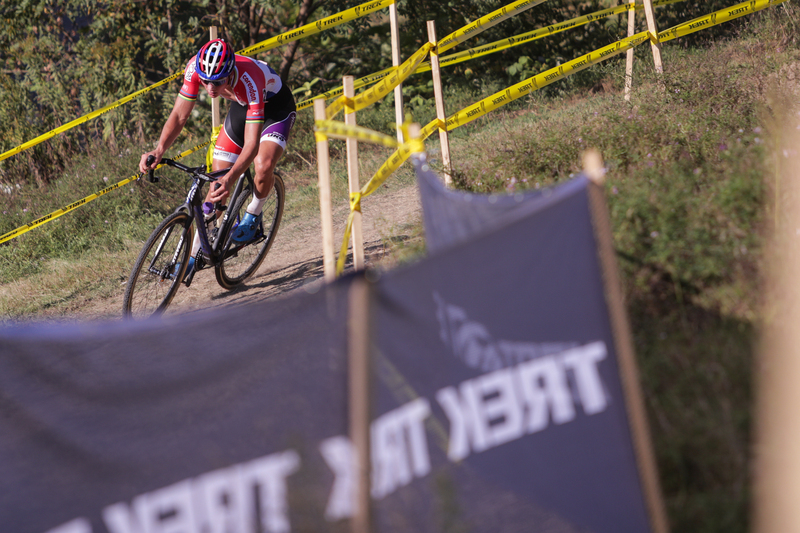 A couple of laps go by and van der Poel has had enough. He puts in the fastest circuit of the day: 6:37. Aerts has to stay within himself. Hold the gap to the chasers. Keep flying the Trek flag. It’s the final lap and a thin field of competitors is suffering its way to the finish. Only 21 of 66 starters will finish on the lead up. Perhaps the 11 DNFs got the better end of the deal. Same with the dozens who got pulled for being lapped. They are already working on recovery for Sunday while the leaders push on. I’m dragging myself to the finish line, hoping to catch van der Poel posting up. 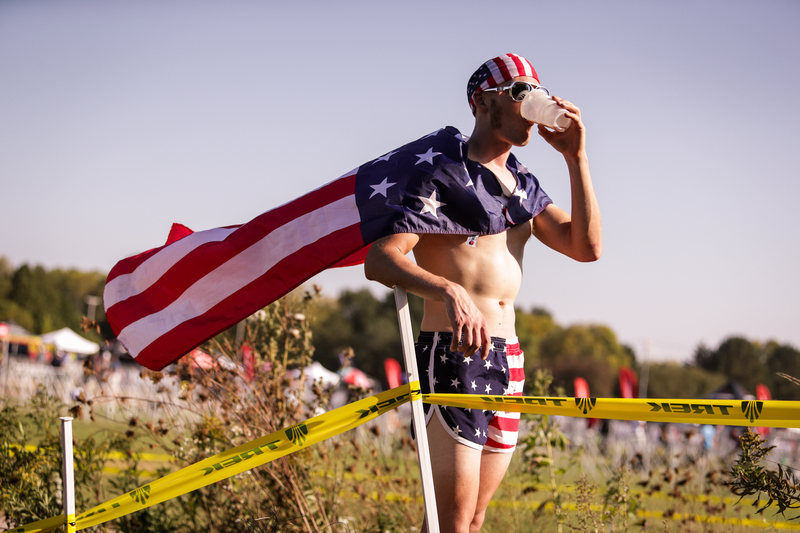 My pre-race hydration apparently did little. It’s getting hotter. Time to stuff myself in the photo scrum with a dozen equally-overheated photogs. Van der Poel makes it official, crossing the line with Aerts 22 seconds back. Aerts did what he came to do, though. 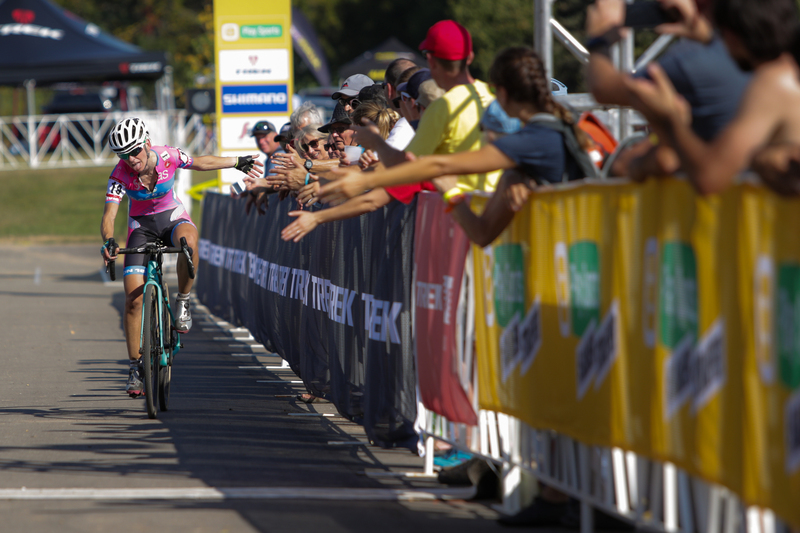 But just in case there’s any doubt, Aerts positions his bike parallel to the finish line and points to the bold Trek logo on his downtube for photographers to see. Every good guest extends a thank you to the host. Finishing just behind van der Poel will do nicely. Riders roll in and collapse to the turf. It’s a scene that plays out at most races, especially the hot ones. This is a little different, though. Some here haven’t raced in these conditions anytime recently. 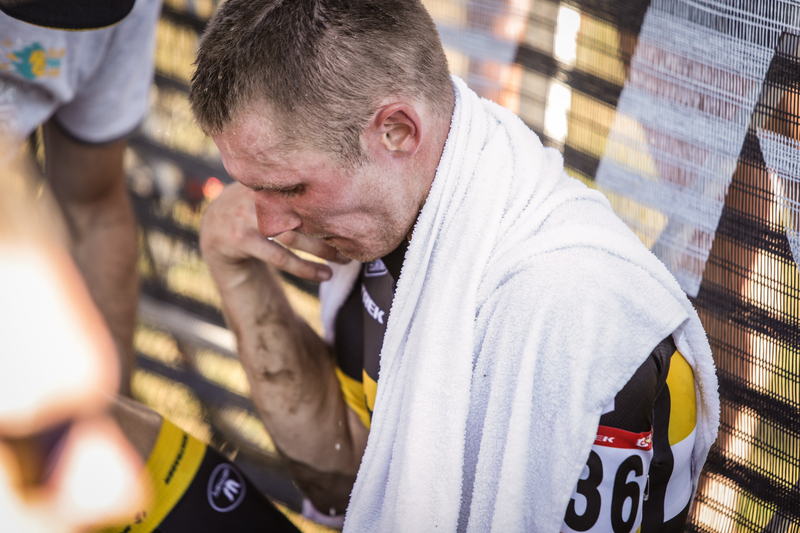 Soigneurs and team managers are drenching gutted finishers will water and draping them in cold towels. 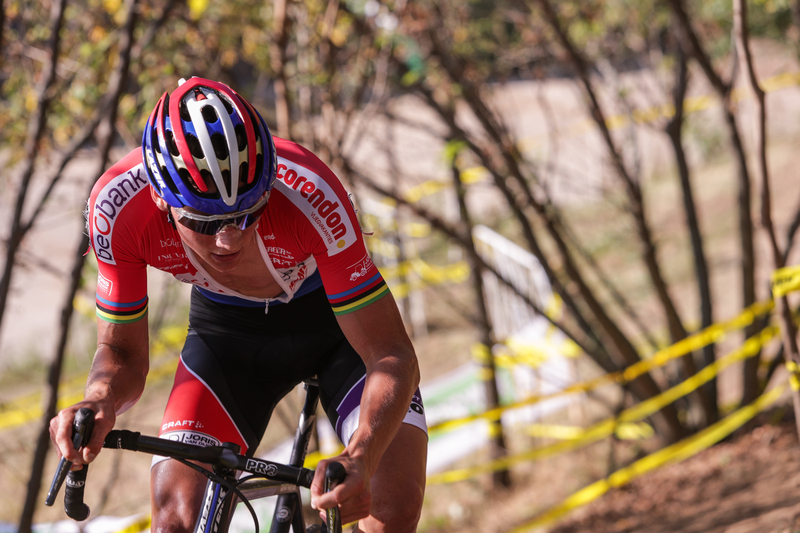 But van der Poel appears unfazed. 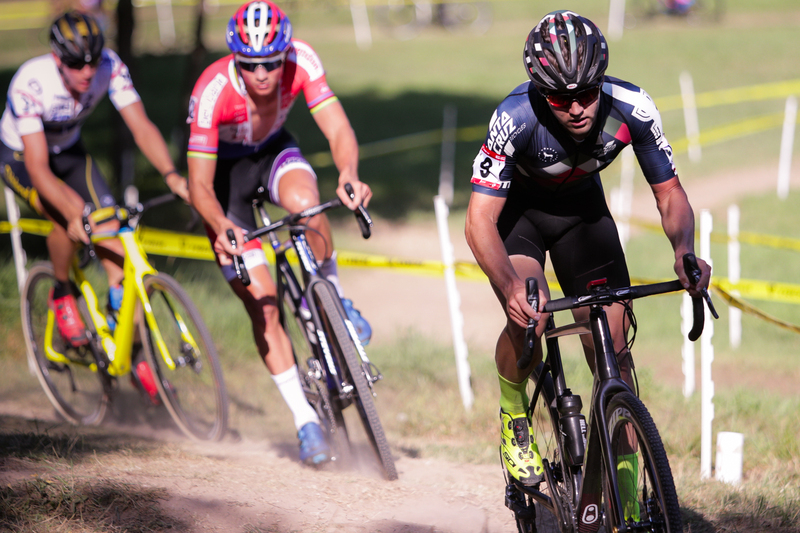 He’s coming off a summer that included a few World Cup mountain bike races. This heat feels familiar. Unlike his competitors, he stays on his bike. He even takes a moment to pop a wheelie for fans and maybe send a reminder to the competition that he’s the clear favorite for Sunday. I walk back into the cool confines of the media center, plop three bottles of water in front of my laptop and start to go through the images of the day. Everyone who pops up on my screen got a full preview here today. Temperatures are expected to hold near 90 for Sunday’s World Cup. 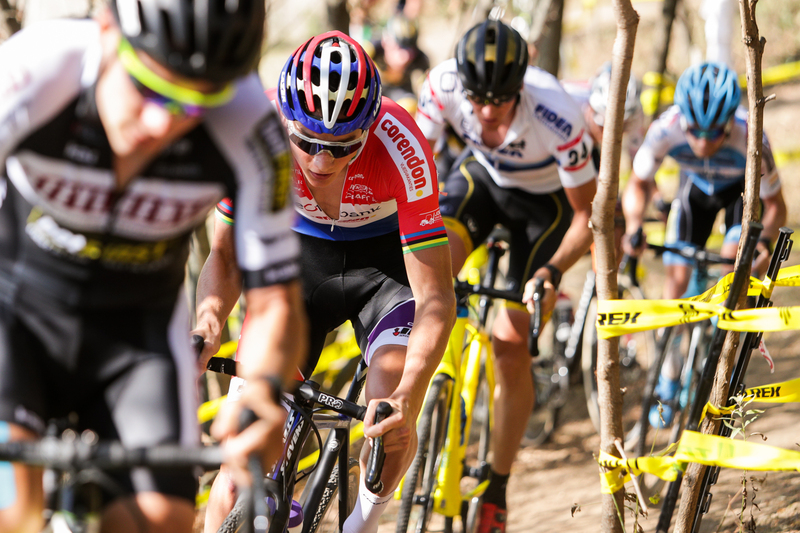 Other than a few World Cup-only course changes, everyone here knows what’s coming. The others don’t. It remains to be seen whether racing today was the right call to make. Regardless, hydration is the priority now. Stay topped off. Get heavy.